"One Caspian Tern seems to be saying to his companion; `This is called the `tern kick'." Artist comment: "This is a companion piece to two other paintings that make up a triptych of Caspian terns on the beach of the northwest Pacific Ocean. On a warm summer day, I observed the terns seemingly doing almost people-like things (i.e. communicating, playing, sunning and more). In the air, Caspian Terns are elegant and graceful. On the ground they can be comical, clownish. Here two of them seem to be trying to impress a seagull with their mastery of impressive moves. Of course. the gull will have none of it! I painted the sand a warm yellow to emphasize the summer mood. Then the semi-shadows were put in with a soft grey. The black and white and red-orange of the birds stands out nicely." 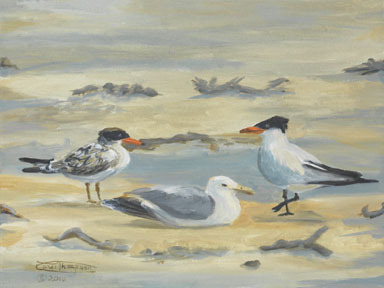 "This Is Called The Tern Kick" is a limited edition, giclée print from an original oil painting by Carol Thompson. The edition includes 3600 authorized, signed, limited edition prints (3500 numbered and 100 artist proofs). Release date is February 2016. Image size and substrates vary. All prints are signed and numbered by the artist and include a certificate of authenticity. Paper prints are shrink wrapped on foam board. Canvas prints are coated with a protective spray.